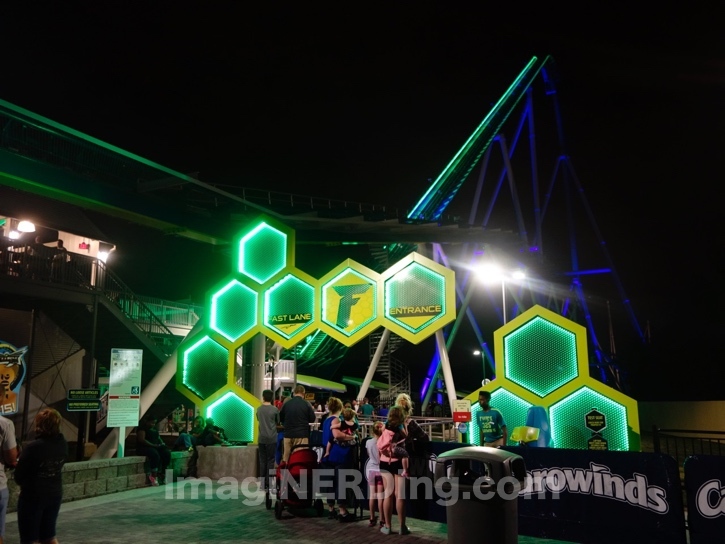 Carowinds Fury 325 at Night! Fury 325 at night is one of those not-to-be-missed opportunities. Of course, riding any roller coaster at night can be such a different experience. When you ride the world’s tallest and fastest steel roller coaster at night, it’s sublime. And even more powerful. Powerfully sublime? Or sublimely powerful? 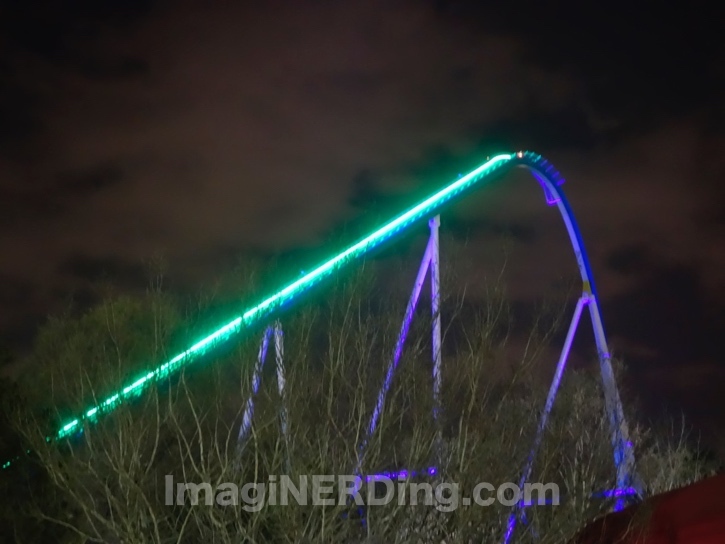 The lighting package for Fury 325 at night is glorious and can be seen from all over Carowinds and by parts of Charlotte. 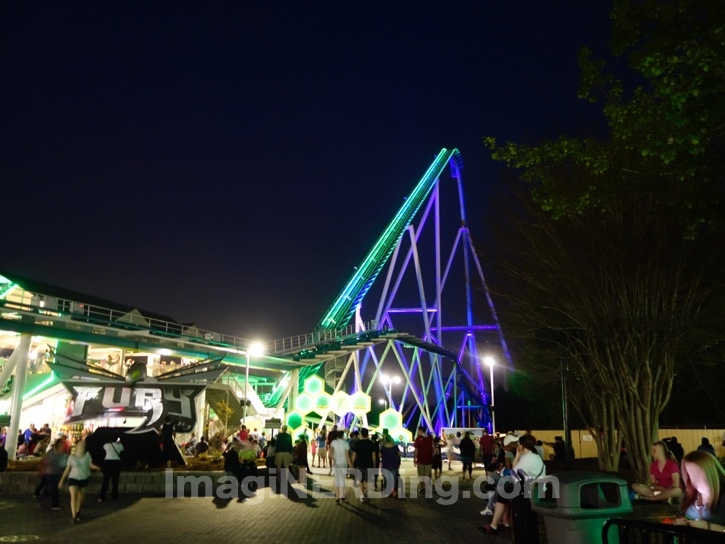 The green, purple and blue accent lights, as well as the towering lift hill, call like a siren. It’s pretty hard to resist her call. The lift hill has always reminded me of a lightsaber and seems to set off the dark clouds of the Carolina night sky. This shot was taken from the seating area of Papa Luigi’s Pizza. I had to balance my camera on the fence. Fury Plaza is always a hive of activity (get it? ), and is even more exciting at night. With the low-slung load building and the extended queue near the lift hill, you can truly see how magnificent the 325 feet of the lift hill actually is. Sometimes, you can even see a plane from Charlotte Douglas International Airport fly by! The Fastlane and stand-by entrance to Fury 325 continues the hive motif. There is a Fury 325 seat so you can see what you’re about to experience. As a reminder, you can’t take anything on the ride (like bags or your drink cup). You have to have a non-rider hold your stuff or put it in one of the lockers near the ride exit. 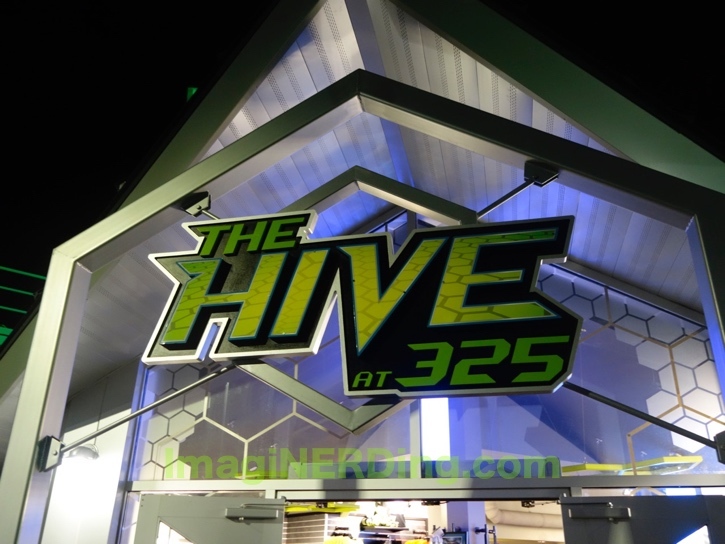 The Hive at 325 is the exit/gift shop for the roller coaster and is a great spot to check out all Fury 325-related merchandise. There are a lot of different t-shirts, cups, mugs, keychains and other paraphernalia to assuage your Fury Fever. Or feed it! Cups, t-shirts and hats! Oh, my! 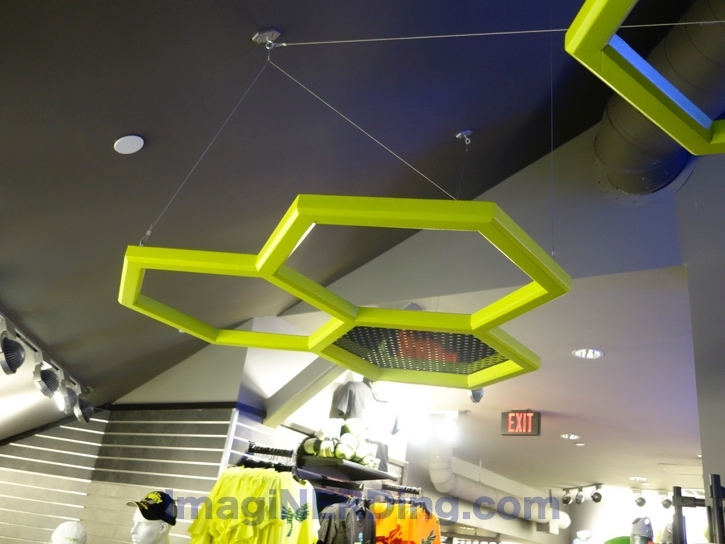 I do like how they’ve repeated the hive motif throughout the queue and the store. It’s a small store, especially when people are viewing their ride photos or just heading to ride again. 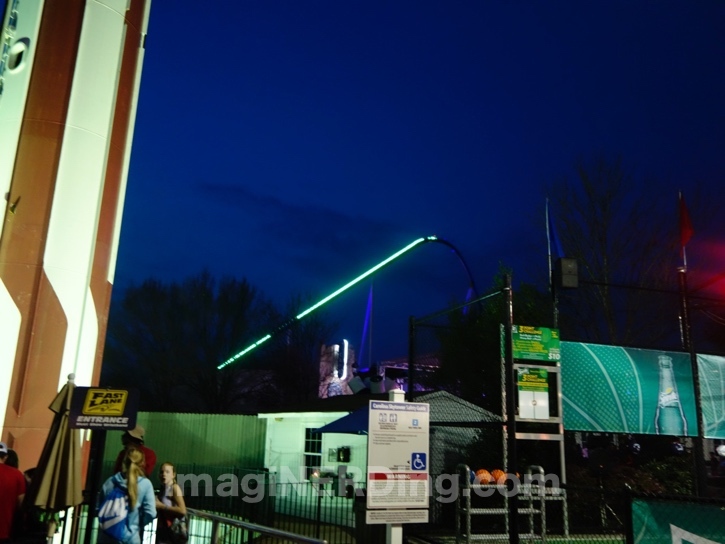 A shot of Fury 325 at night from outside the park. Yes, that’s the other amazing coaster at Carowinds: the Intimidator! 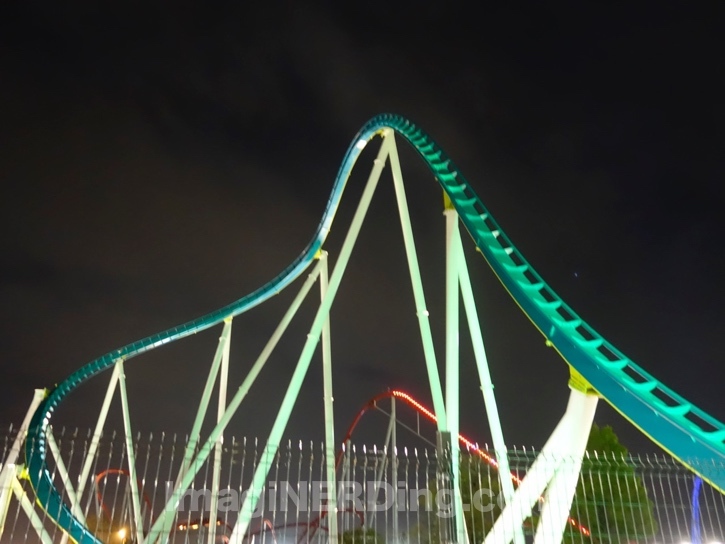 Have you experienced Fury 325 at night?